She describes herself as a "girl from the barrio of Northside Houston" who never dreamed her life would be what it is today. The girl is now all grown up and her name is Michelle Tovar. After graduating from Heights High School's magnet program, Tovar and her parents looked at the best options for college. She was accepted at a few colleges out of state; however, her father was hesitant to let his only child go to school out of Texas. She came from a hard-working family. Both parents worked as custodians in Houston—her dad is from Eagle Pass, Texas, and her mother emigrated from Mexico. "Growing up as an only child in a Mexican/Mexican-American household, I worked to help my family. So, staying near home was the best option," said Tovar. "UHD was right fit for me." Like many UHD students, Tovar began a college career as a full-time student while working part-time. Her initial intention was to study her first love—English literature—but she eventually moved toward the sciences to study biology. While pursuing her degree, Tovar's mother fell ill, which required her to cut back on school. She credits UHD for being there for her during such a difficult time. "It took me longer to finish my bachelor's," she said. "Thankfully, the University was so incredible in helping me stay on track. Because of my parents' illnesses, I had to step away, at times, from school, but my professors were always understanding. I felt like I was a part of a bigger family. …My UHD family." By pursuing a degree in biology, Tovar planned to enter the medical field, perhaps in microbiology, but she had a change of heart. "I came to realize that my passion didn't really lie in biology," she said. "I wasn't connecting as much as I had hoped." Tovar began to explore philosophy by taking a few courses and soon re-discovered her love for the humanities. "I loved it. I excelled. I felt confident again," she added. She graduated in 2010 with a Bachelor's of Arts degree in philosophy. Tovar decided to attend graduate school on a philosophy track. Then, her father took ill. Now, with both of her parents ill, Tovar knew she had to re-evaluate what she needed to do. So she asked herself the question: "What do I really love to do?" 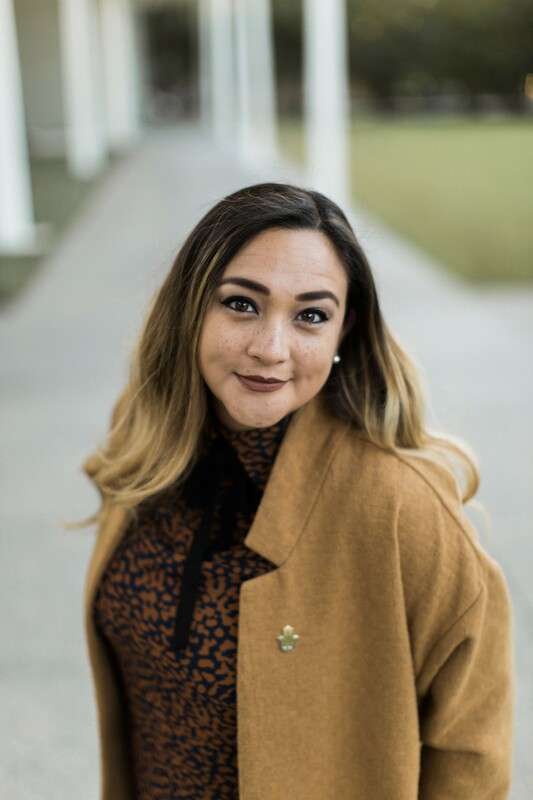 While trying to figure out the next step in her career, Tovar worked as a cultural arts director with the Boys and Girls Club of Greater Houston in Spring Branch, where she work with students through after-school programming by providing whatever they needed to keep them involved in their education. "I realized that I really loved working with students," said Tovar. "I enjoyed it and I felt that this was something I could pursue as a career." Tovar returned to her alma mater in 2012 and earned an alternative certification in Bilingual Education (EC-Sixth Grade). From then on, "everything changed," she said. "Because of that program, I was able to get my pre-service teaching hours; get a job at HISD, which eventually led to teaching in Aldine Independent School District." During that time, Tovar's mother passed away. While teaching fifth grade, she earned a Master of Liberal Arts in history/social justice with a focus on Mexican-American labor history at the University of St. Thomas Houston in 2015. "History has always been a part of my life," she said. "Growing up I remember my father being an avid reader of Native American history and World War II literature and it was through his personal experience that I grew up learning about the Chicano movement." People would often ask Tovar what would she do with such a degree as a teacher. "I tried to incorporate what I learned while getting my master's into my curriculum" she said. "Many of my students were English language learners who didn't have the background knowledge of history as their peers. So, I felt it was important for them to identify and comprehend historical facts, in order for them to make connections to what they were reading in their courses." Wanting to keep busy during the summer months in 2011, Tovar discovered a fellowship opportunity at the Holocaust Museum Houston—Warren Fellowship for Future Teachers—created for pre-service teachers. She loved the experience so much that she completed another one in 2012—Max Kaplan Summer Institute for Educators—a more advanced scholarship for Holocaust and genocide education; and another one in 2013. "These fellowships equipped me to use what I learned about the Holocaust and genocide in my classrooms," said Tovar. "It challenged and prepared me as an educator to find ways to not overwhelm or frighten my students, but instead to make connections to current social issues occurring through the use of literature that my students could find relatable." Once again, Tovar tasked herself to find something to do during her summer break from teaching. She applied for the Smithsonian Latino Museum Studies Fellowship and was accepted into the month-long program at the Smithsonian Latino Center in Washington D.C.
Little did she know that her frequent interactions with HMH—through fellowships, teacher workshops and with the Museum's Director of Education Dr. Mary Lee Webeck—would lead her into a new career path. Then she received the call. Webeck presented Tovar the opportunity to be the first-ever Associate Director of Education for Spanish Outreach and Latin American Initiatives at HMH. The serendipitous news of the fellowship and a new career opportunity changed the course of Tovar's career in ways she never imagined. "It was like fate, like the hand of God, to do this fellowship and a career in the museum world, which was completely new and fascinating to me," said Tovar. "I really thought I would be a traditional classroom teacher forever." While in D.C. at the Smithsonian, Tovar researched the history of Bittersweet Harvest: The Bracero Program 1942-1964, which she was instrumental in bringing the bilingual traveling exhibition to HMH—the first-ever in the Museum's 20-year history. The exhibit, organized by the Smithsonian's National Museum of American History, featured a lecture series of scholars from around the country to discuss immigration, labor and Mexican-American history—topics never before discussed at HMH. Tovar considers this one of her proudest moments in her career, thus far. "One of the great things about the Museum's mission is to teach the dangers of apathy and prejudice," she said. "Especially in Texas, our Latin-American history is not commonly taught in textbooks or in school curriculums. I truly believe that it's important for students to know their history is significant. Our own stories need to be heard and taught in classrooms and museums throughout the country. "To be in this position at HMH, I hope to inspire educators, students, and their families to learn about history of the Holocaust, as well as other atrocities that have affected Latin American countries," Tovar said. "We are using the lessons of the Holocaust to teach students that unchecked bigotry and intolerance leads to persecution and violence. We stand in solidarity with all vulnerable groups, and offer a space to learn and understand the role of a citizen in our global community." Since landing at HMH, Tovar has been globe-trotting—from Buenos Aires, Argentina to Washington, D.C. to Santiago, Chile, where she studied the social movements of students and education reform thanks to a Fulbright-Hays Seminar Abroad Fellowship. First, Tovar is continuing her love of education. She's pursuing a doctorate in Curriculum & Instructional Professional Leadership in Social Education, which she hopes to complete by 2019, at the University of Houston. Second, thanks to her position at HMH, Tovar will be busy with the Museum's first Latino Initiatives Advisory Committee. And by the way, she's not planning to taking a break any time soon.